You know what it means when the Floobian geese begin flying east, don’t you? What’s that? You say you don’t? Well, neither did I. But, now I know that means it’s time to outfit your dirigible, head to the giant zeppelin castle Matterhorn, and prepare for the annually zany Zeppelin Rally! So secure all valves and ready the steering. And don’t forget your aerodynamic headgear. Dang the Lemmings! Full speed ahead! In Zeppeldrome, pilots navigate their airships through a course ridiculously littered with obstructions in a desperate race for the finish line. Not only must they contend with hazardous obstacles like Chunk Chunk Machines and Old Folks Looking for the Farmer’s Market, but they’ll also be battling one another! 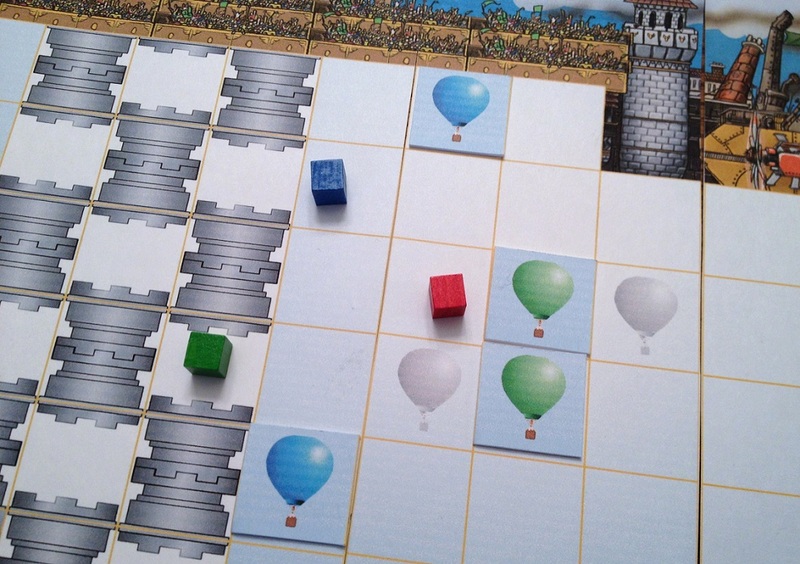 Players move their dirigibles and interact with other airships through card play. Every card in Zeppeldrome offers two options. The top portion provides a flight plan, illustrating a number of directional vectors (or spaces) in which your airship can move. The bottom part contains a special action. You receive four of these cards to start the game. Choosing a card for its flight plan and tracking movement. 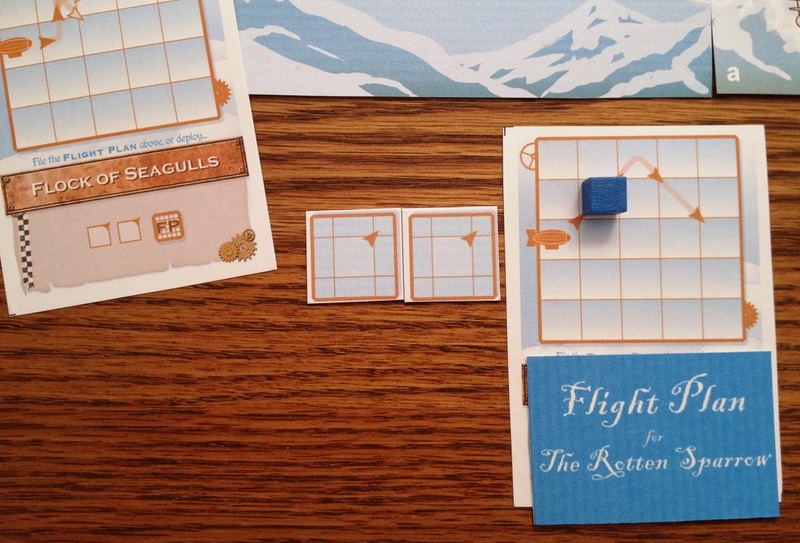 At the beginning of a round, players simultaneously choose a card with a desired flight path, laying that face down to the table. When everyone has “laid in a course,” they’re revealed. Alternately, if you don’t like any of your flight plan options, you may keep that card face down, instead of revealing it. Doing so allows you to move only one vector, but in any direction of your choosing. Next, all pilots take turns playing one card at a time from their hands, if they wish, utilizing the special action or ability listed. Many of these add movement to your flight plan or subtract vectors from those of your opponents. Some totally deactivate flight plans altogether or simply move any dirigible immediately in some arbitrary direction. You may not use your flight plan card’s action. Beginning with the current leader – as determined by a combination of who is out in front and highest in altitude – players alternate moving their ships one vector at a time, according to their flight plan and any additional vector chits played during the action card phase. During movement, a few action cards may also now assist your flight or hamper that of your competitors. If you run into an object or an opponent while flying your dirigible – and you will, routinely – then you simply “bounce.” You remain where you are and wait. When it’s your time to move another space as the action comes back around, you then proceed to the next directional vector as indicated by your flight plan, assuming of course that space isn’t also blocked! The first player to limp across the finish line wins! I say “limp,” although no damage is actually tracked in the game. But at the rate at which you careen off of objects, opponents, and the insides of the Matterhorn, I have to imagine there are more than a few cracked spars, canvas rips, leaking valves, and frayed lines. It’s like a giant pinball machine in there! Full Steam Ahead or Full of Hot Air? Zeppeldrome isn’t just any old airship race. It’s an airship race inside an airship! Such a monstrosity has got to be the pinnacle of humanity’s creative achievement. I mean, imagine the Indy 500 run inside a ginormous Ferrari. That’s just insane! Well, playing this screwball game is often as outlandish as the concept sounds! In the spirit of dirigibles racing inside a dirigible, the theme is roundly wacky. The best way to describe it is probably Steampunk meets Dr. Seuss. Obstacles include suicidal lemmings, monstrous mashing machines, and absent-minded retirees. About the only hindrance that doesn’t sound like it’s straight out of a Douglas Adams book is the slalom hoop. Some spaces actually give you a boost, and those can be just as bizarre. My favorites are the floating anvils that provide ballast. The card text is also quite humorous. The actual actions which they perform are non-thematic, usually as simple as adding spaces to, or subtracting them from, flight plans. However, rather than just blandly designating such alterations, the titles and flavor text provide witty and comical flair to keep the mood light. You can use Speedy Gerbils, an Extra Doohickey, Tempered Zip-Fins, or you may have to Get Out and Push. And there’s always the effective Don’t Ever Touch This Button Button! The final production with polished art and components should really highlight the theme. Just out of the Chunk-Chunk Machine and into the Old Folks Looking for the Farmer’s Market! All of this zaniness camouflages a surprising bit of strategy. Zeppeldrome is not a significant brain-burner, by any means. Yet one of its sub-titles is “the puzzle” game. If you’re one that likes to figure out how Tetris blocks fit together within a grid, you’ll especially enjoy this design. From a selection of four flight plans, you need to choose the most ideal course to navigate the barriers before you. And sometimes the best option means bouncing off of things. At first, it may not seem like you’re making progress. But then you quickly realize that your plan’s next step will finally get you around that objectionable object. As for the other cards, most can be used on any captain. You need to decide whether its ability will best assist your own flight plan, or rather mess with an opponent’s. Action cards give you considerable influence over the race’s development in jockeying for position or slowing down a runaway leader. However, they’re often best used to modify your own movement by adding spaces before or after a flight plan. It’s amazing how you can alter course in this manner to get around a threat sooner than you normally would have been able – or to add significant movement at the end. So you don’t want to fret and worry too much about your opponents, else you risk passing up optimal actions. 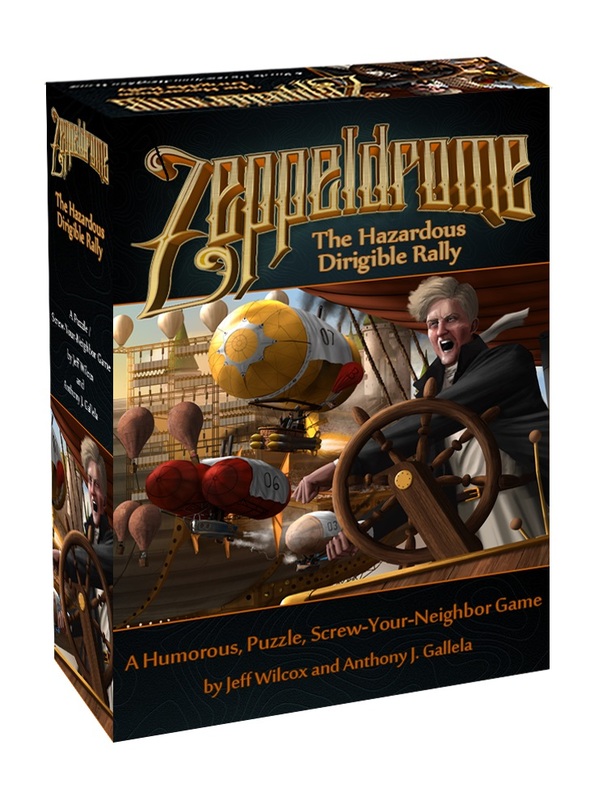 Along those lines, Zeppeldrome is true to its other sub-title – “a screw your neighbor” game. The needle rides high on the spite meter! The design’s interaction can indeed be frustrating, because most of it occurs after you’ve laid out your course. So even though you’ve just figured out the best combination of flight plan and additional vectors, an opponent comes along and deactivates it altogether. If you’re a frequent target, you’ll soon be staring at nothing but tailfins. Using an action card to add vectors before your flight plan. Generally speaking though, the “take that” elements are not overwhelming. That’s mostly because each player only has 3 cards each turn, creating a built-in restraint. 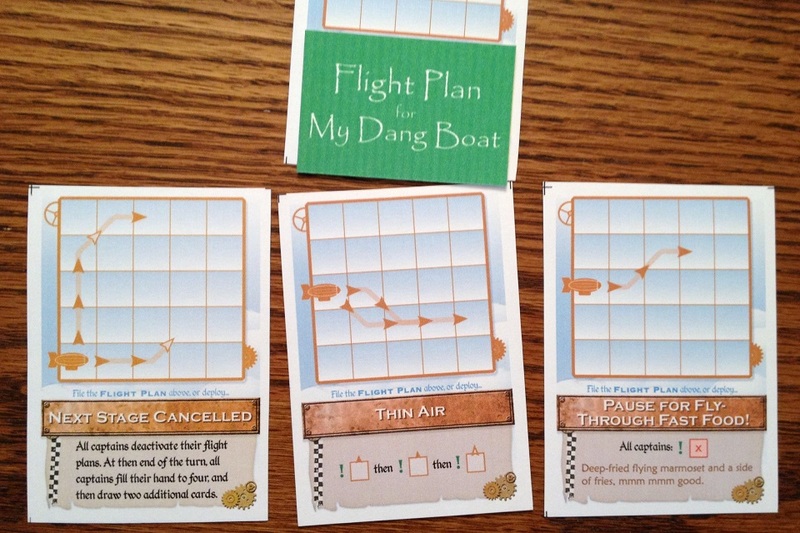 Not only will you use one or more to modify your own course, but some flight plans allow you to move an additional space for the cost of discarding one card. In reality, you won’t be playing all of your cards in a spiteful manner every round. So even though you’re sure the captain next to you is Googling the weak points of Victorian dirigibles, attacks are never crippling. There’s no starting over, nor any fiery death plummets, and very rarely are you forced to fly backwards. 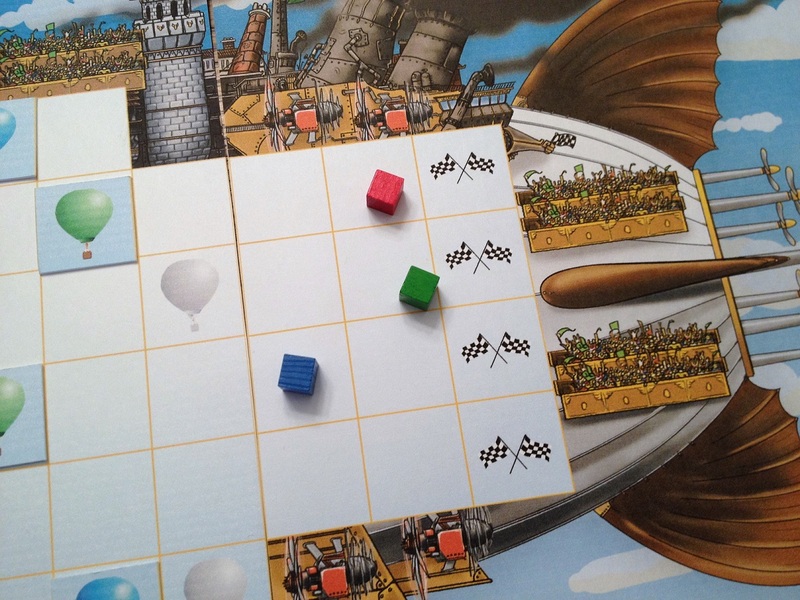 True to the racing game genre, Zeppeldrome includes several different modular boards to create a wide variety of courses. Therefore, you can customize the course’s difficulty and make it shorter or longer. The game is also action-packed. Pretty much every facet of game play is simultaneous or nearly so. Action cards are played one at a time and movement is resolved one vector at a time in alternating turns. There’s very little downtime – players are constantly involved. 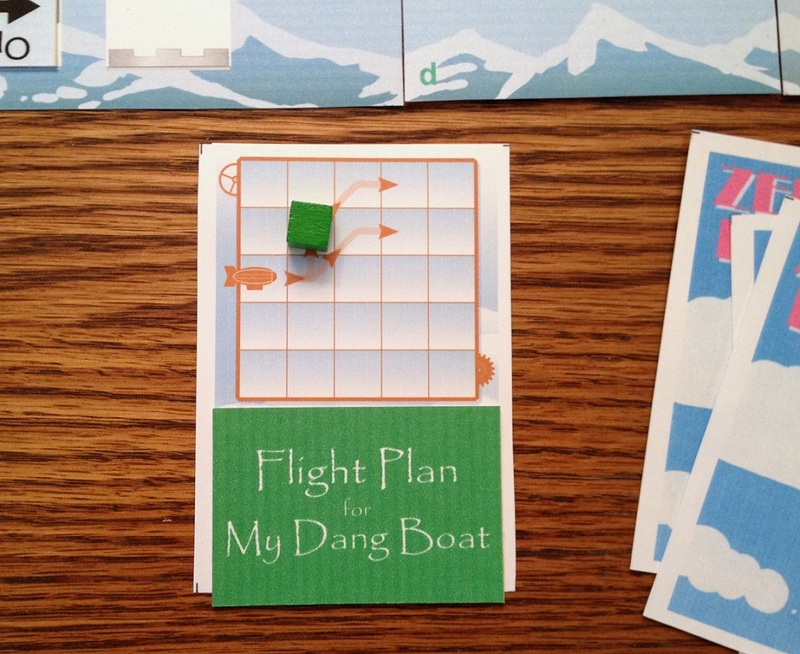 There is some potential for analysis paralysis at the start of a round as players choose flight plans. It is limited by the fact you only have 4 cards to analyze. However, the deeper planning lies in figuring out how the other cards’ actions can best combo with your flight plan to increase its effectiveness, while still retaining one to throw a wrench into the cogs of a competitor. Also, despite the fact that game play itself moves quickly, there are times you’ll feel that your little ship isn’t so much. Whether stuck behind a series of hazards, stiffed by a hand of bad cards, or stranded by the machinations of your dastardly foes, progress sometimes painfully inches forward one vector at a time. The slow moments are befitting of the theme, at least. These are sluggish, lumbering bags of gas, after all, not rocket ships. Zeppeldrome is a light, humorous romp that doesn’t take itself too seriously. However, beneath the offbeat theme lurks an actual puzzle game with a healthy dose of interaction, both of which require forethought. It’s accessible, simple, and moves quickly. Like any other game, it won’t appeal to everyone. 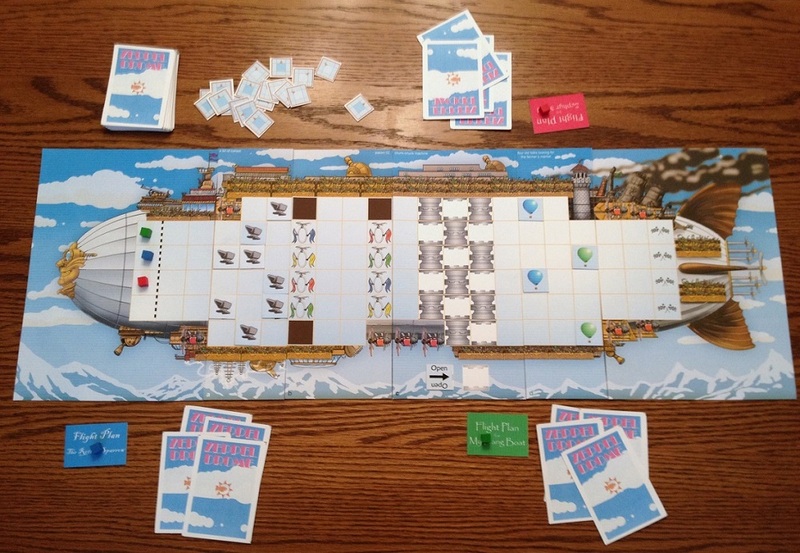 For those that like puzzling strategy, zany chaos, and amusing spite, this dirigible race may just be the ticket for a silly and entertaining hour. As long as it’s played with tongue firmly in cheek! Zeppeldrome will run on Kickstarter through February 16. If you’re interested, steam on over to the campaign page to pick up a copy. You can get the basic game for a $29.00 contribution (MSRP of $35), with other perks possible at higher funding levels. Hurry before the offer flies away. Just to make sure your rocket boosters are properly aligned to avoid any unfortunate mishaps!